Soap making requires practice and a certain level of skill. The use of caustic soda, commonly referred to as lye, makes soaps that need to cure for nearly a month before you can use the soap. Making your own soap allows you to add your preferred ingredients such as different fragrance oils and herbs for a one-of-a-kind concoction. The caustic soda reacts with water and helps form the base for various soap recipes. Pour 32 oz. of water into a plastic container. Move the container outside or use ventilation fans before adding the lye. Add the lye to the water. Pour the lye slowly and stir it continuously with a plastic spoon. Place the mixture off to the side and allow it to cool. It will become hot once the lye dissolves into the water. Allow the lye to cool to a temperature of 95 degrees Fahrenheit. Use a candle thermometer to check the temperature. You can purchase these inexpensively at craft supply stores. Combine 24 oz. of coconut oil with 38 oz. of a solid vegetable shortening. Place these ingredients on the stove top over medium high heat. Stir until the ingredients melt together. Add 25 oz. of olive oil and your desired fragrance oils. You will only need to add a few drops of essential oil to the mixture. Let the oil mixture cool completely. Spray a non-stick product onto the soap mold. Combine the lye with the oil mixture slowly once they both cooled off. Stir the ingredients slowly. 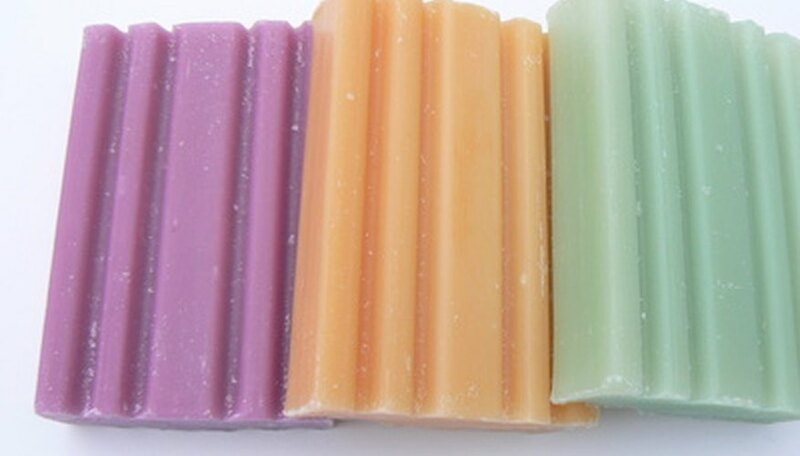 Add the soap dyes to the mixture if you would like to make colored soap. Pour the soap mixture into the mold. Wrap the mold with a towel, and allow it to cure for 18 hours. Remove the towel and allow it to cure for an additional 12 hours. Remove the soap from the mold. Let the soap cure for 3 to 4 weeks for best results. For best results, use the soap within six months. The amount of soap that the recipe will yield, depends on the size of the soap molds used. Caustic soda or lye is commonly referred to as sodium hydroxide at the store. Wear gloves and goggles when handling lye. Lye can cause severe burns and damage your eyes.